John Fante Square/Free walking tour/King Eddy Saloon: Fante-stic Fete! JOHN FANTE, novelist, short story writer, screenwriter, and chronicler of Old Downtown, will be honored on April 8th with a city square at 5th Street and Grand Avenue. H.L. Mencken mentored him. Orson Welles collaborated with him. Charles Bukowski said of him, “Fante is my god.” Robert Towne, who found John Fante’s novel Ask the Dust while researching Chinatown, declared it “the greatest novel ever written about Los Angeles” and endeavored for 30 years to bring it to the screen. 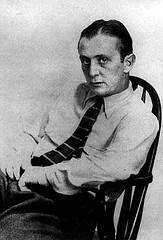 On Thursday, April 8th, fans of Fante, one of L.A.’s greatest, under-appreciated writers, will be dancing in the streets…or more accurately, at 5th Street and Grand Avenue, when it is officially dedicated as John Fante Square by Councilpersons Jan Perry and Jose Huizar on the 101st anniversary of Fante’s birth. Fittingly, the Square is next to the Los Angeles Public Library, which was a constant source of reading material for the young writer and which is where Charles Bukowski discovered the work of his literary hero, and at the bottom of Bunker Hill, where Fante lived and worked and which he chronicled in the novels about his autobiographical anti-hero Arturo Bandini, creating a rich portrait of a now-lost downtown Los Angeles in the process. Compelling figure and fabulous writing. I assume you must be very beautiful. Let’s meet at King Eddy’s Saloon for a beer, peanuts and Pitch. You are obviously a remarkably intelligent person of exquisite taste and clairvoyant perception! Substitute a Slim Jim for the p-nuts and you’re on!